If you’re in need of a contractor to render lawn services for a backyard, garden, park or for other grass areas of your concern, make sure you have everything covered from comprehensively worded contracts to actual lawn services of quality. 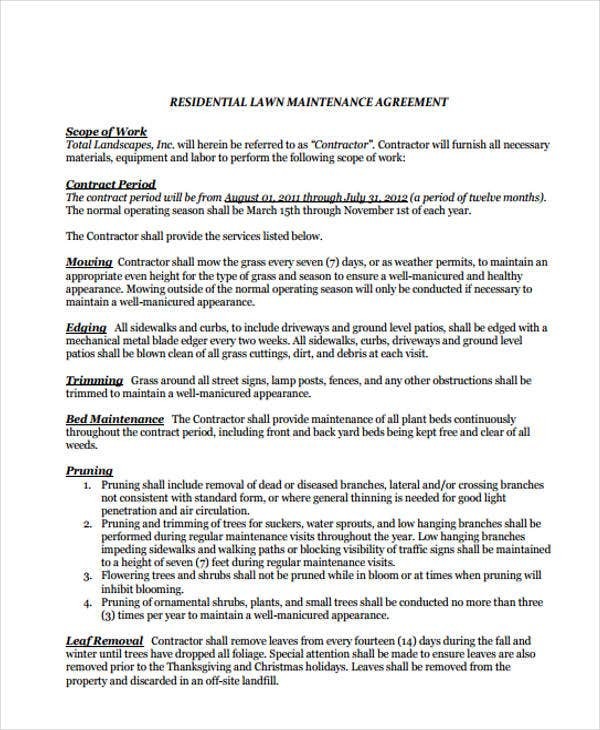 Take your agreements into writing by executing a legal contract for lawn service. 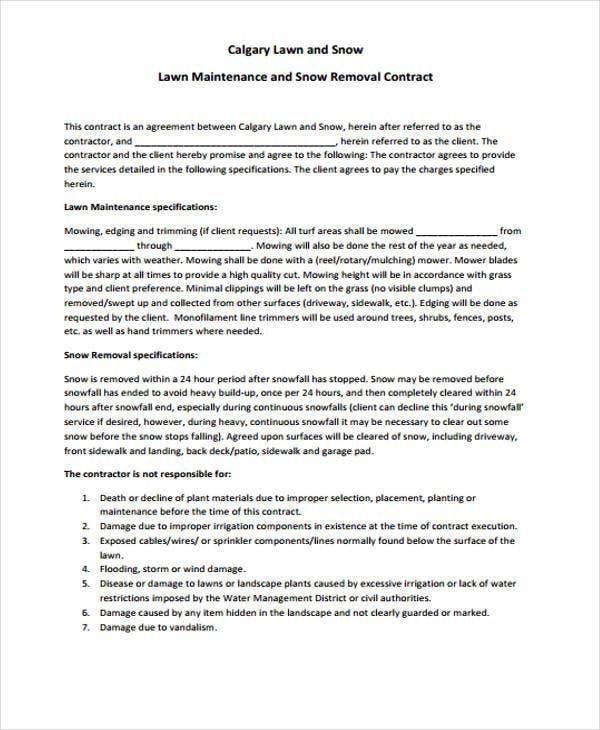 You may also see Contract Templates. 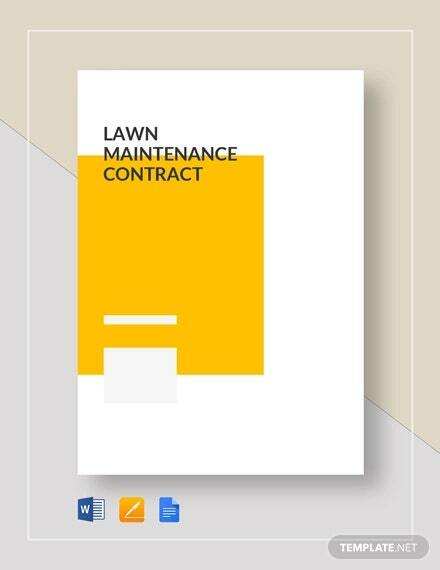 Most clients prefer a lawn service contract alongside a Construction Contract. In cases where buildings are situated in areas that need lawn maintenance and grooming, lawn services are sure of great help. 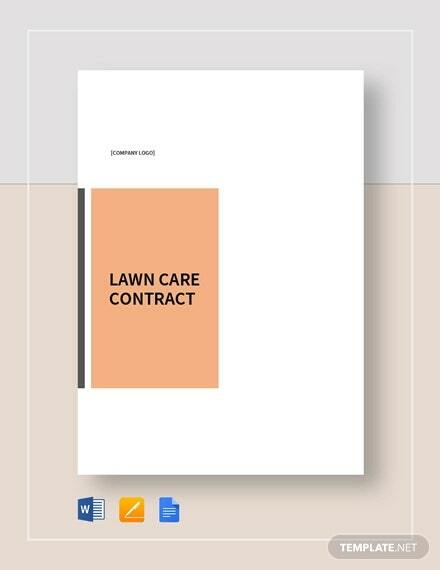 Keep up with this page and look up our set of lawn service contract templates for quality contracts. 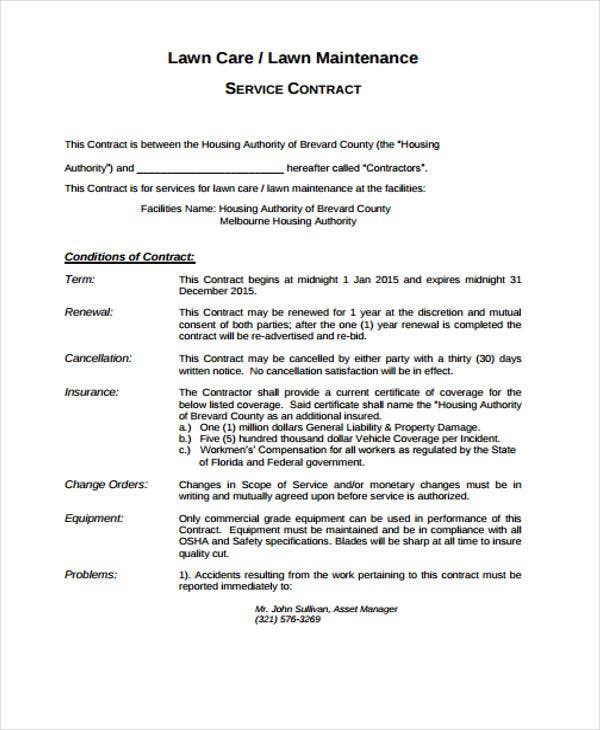 How to Write a Lawn Care Service Contract? Lawn care service is a noble kind of business dedicated to maintaining lawn cleanliness and appearance. 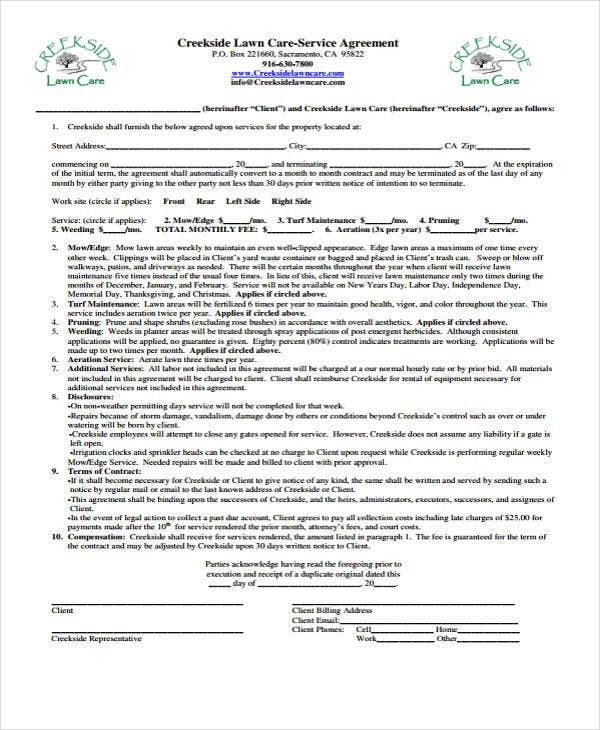 Most lawn service contractors render their services and fill out a Business Contract Template sufficiently in order to state their terms before complying of what is expected from them. 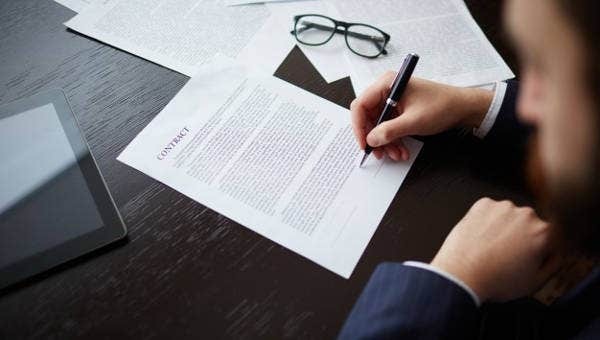 Property information – Given that this is a lawn service contract, you need to specify on the lawn property or the area where services are due. 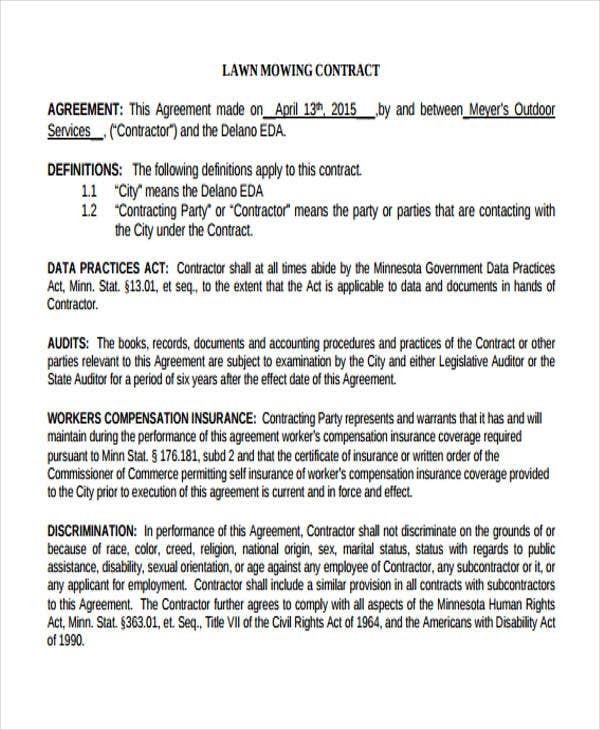 Service agreement – This portion of the agreement must reflect mutually agreed terms between the client and the lawn service contractor. Parties must elaborate on the due compensation and assurance of quality service respectively. 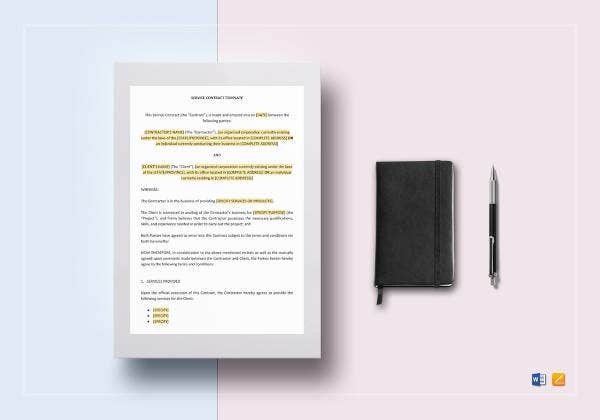 Due date – It is in the discretion of the contracting parties on whether or not they would want to include a service timeline to track the progress. However, the completion date should be properly set so contractors would keep an eye on the fixed deadline. 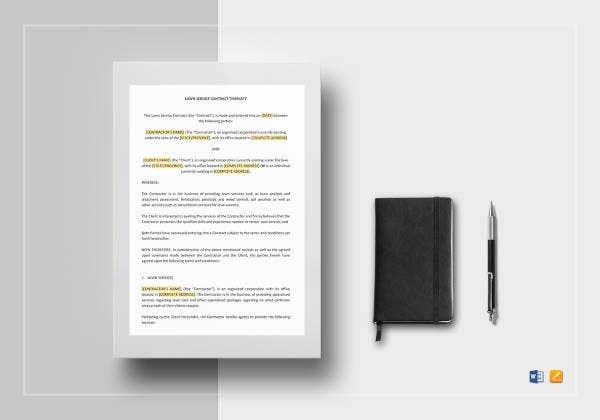 The items enumerated above are all guaranteed in our Lawn Service Contract Agreement Template to suggest nothing but the best content for their contracts. 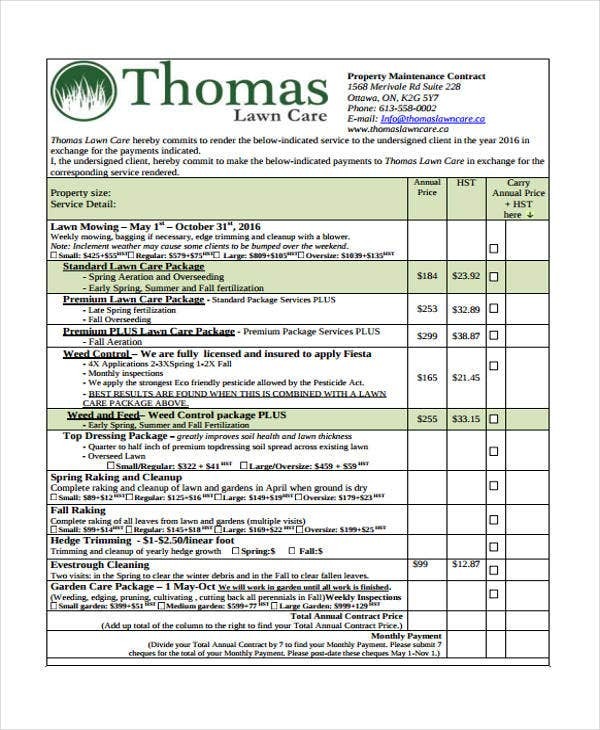 Lawn service contracts are rarely used in small projects. Commonly, it is used among government park projects and other business that concern lawn maintenance. Outline of lawn services – This portion holds the contract altogether. This is the main purpose as to why a contract is created in the first place. An outline of lawn services may include specifications on whether service contractors would mow, trim, weed, or clean up the area stipulated in the contract. Payment scheme – Most service contractors are very particular in dealing with money and a certain payment scheme. It should be properly described depending on what the parties would think is deemed fit. Payment could either come in bulk, installment or upon completion. Either way, parties must note payment in order. Service frequency – Most lawn services cannot be completely done overnight. Clearing up matters regarding lawn service frequency is usually vital in the terms and conditions of a lawn service type of contract. 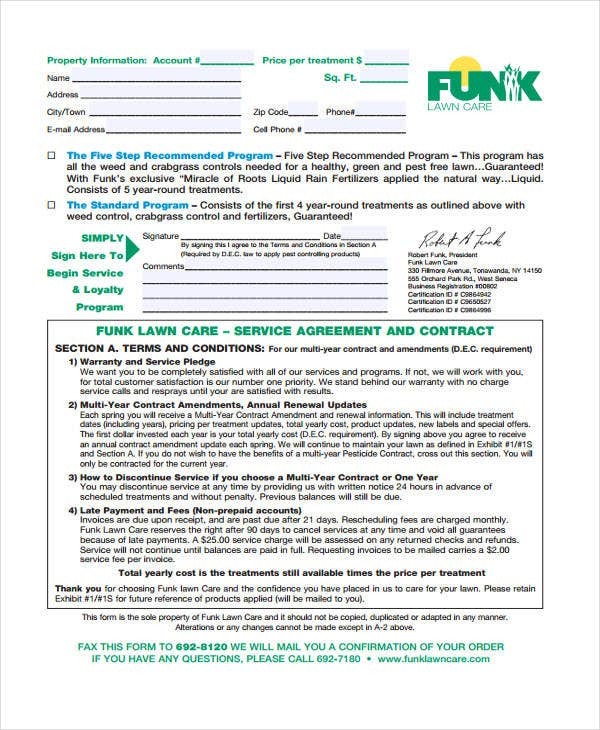 Most of this page’s Free Contract Templates on lawn service observe the common yet vital terms and conditions mentioned above.